One Direction today premiered the action/1D film, ‘Dear World Leaders,’ a three-minute, one-of-a-kind emotive and powerful film composed of hundreds of fan submissions describing the world they want to live in. The film, in support of the action/1D campaign, directly calls on world leaders to listen to the changes they want to see made, to make the world a better place for this generation and the next. “We’ve been overwhelmed by the fans’ response to action/1D. They continue to amaze us with their passion and dedication, and this film goes to show how engaged they are in the issues that affect them. It’s been inspiring to see and hear what matters to them and the world they want to live in,” Harry Styles said. “We’ve had fans from all over the world tell us what matters to them, from equal rights for all to the eradication of poverty, I really hope world leaders take notice of what we and our fans are saying. Hillary Clinton tweeted us her support of action/1D last month – I’m hoping President Obama watches it next!” said Niall Horan. One Direction is now calling on the public to share the ‘Dear World Leaders’ film and the hashtag #action1D on social media. The film also will be broadcast in front of thousands of fans at each of the remaining legs of the band’s “On the Road Again” tour. One Direction launched the action/1D campaign on July 8th. Since then, nearly 80,000 submissions of photos and videos calling out for change were received from 172 countries. The hashtag #action1D has seen a reach of 2.5 billion so far, and trended worldwide on Twitter for 11 hours following the launch of the project in July. 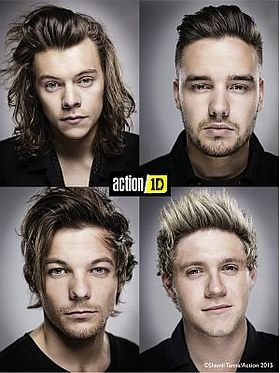 The action/1D campaign is part of action/2015, a global citizens’ movement of which Save the Children is a member. The movement is united by the idea that 2015 can be the year when the world can set the agenda to end extreme poverty, tackle inequality and climate change – but only if global people power compels world leaders to make ambitious commitments at two crucial summits to be held in New York in September and Paris in December. “One Direction has done an incredible thing by mobilizing their huge fan base to speak up about the issues that really matter to them in this momentous year. We hope that by speaking out together, their voices will be heard — and in a way that world leaders cannot ignore. This is the generation that has the power to tackle the most important issues of our time and change the world for better,” said Margherita Watt, director of Creative and Digital at Save the Children UK.